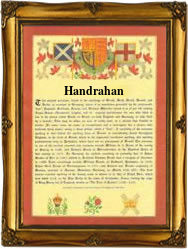 Properly spelt O'Hanrahan, O'Hourihane, O'Hourahan, and others, but more popularly found as Hanrahan, Hourahan, Hourihan, Hourihane, and Handrahan, this is surname of ancient pre 10th century origins. It derives from the Gaelic O' hAnradain which is believed to translate as 'the descendant of the warrior', a meaning which has no doubt helped the clan to achive some popularity world-wide. The vast majority of Irish surnames descend from the nickname given to the original chief. Sometimes as with this name, it is complimentary, but more often it is at least robust, and often 'personal' to a level that it is difficult to see why the original holder should even accept it in the first place. The famous Kennedy clan for instance, put various interpretations on the meaning of their name, but the literal translation is 'ugly head'. It is said that this family of nameholders originated from the area known as West Cork, where they were the erenaghs of Ross in ancient times. An 'erenagh' was a status position in that these people held hereditary responsibilty for the church lands and property in a given area. Not surprisingly this position was one of some considerable power and patronage. The invasion of Ireland in 1169 changed this position, and in time many of the erenaghs were lost their lands in the rebellions and wars which criss crossed the country. Examples of the surname recording include (by Irish standards) the very early recording of Thady Hanrahan, the son of John Hanrahan, christened at St Michans church, Dublin, on August 24th 1682, and later that of Daniel Hourihane at Drimoleague, County Cork, on December 5th 1682.